Using a screen recorder is becoming common among users. It’s used for various purposes e.g recording video, game or capturing some pictures from the screen. You’ve also seen many YouTubers making videos about gameplay, creating a solution video or giving reaction to any video/movie. There are many different reasons behind using a screen recorder but finding a good screen recorder isn’t that much easy task. There’re many options available in the market but each of them lacs some features which are necessary. Almost all the screen recorders are paid and you probably need to lose some money to enjoy their features. So, why not dig into the features a screen recorder offer and find out your needs and hopes from a screen recorder. There are many things you need to take care of while choosing the best recorder which can record your screen e.g FPS (Frames Per Second), Shortcuts, Features, Effects, Tools etc. If you want to record a gameplay with your face in it, then you need a screen recorder which can do both things at a time e.g recording your gameplay and your face from the webcam. Now, it’s obvious that FPS matters a lot. If your gameplay is recorded at low FPS rate 20-25FPS, then your viewers will be disappointed. 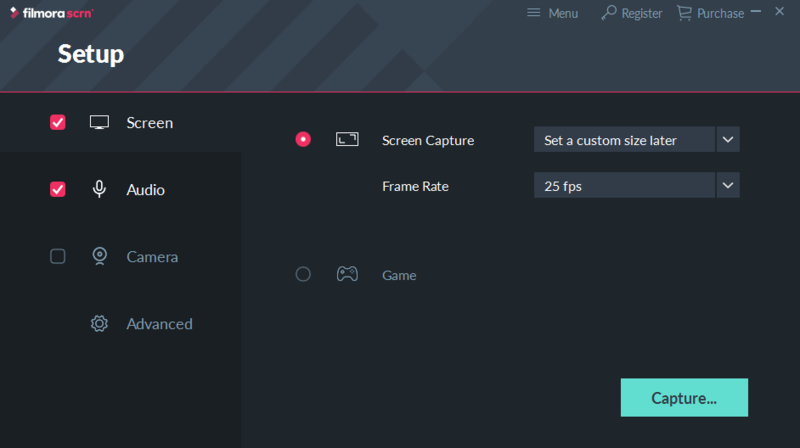 Hence 50+ FPS is recommended while recording a gameplay or anything from the screen. Filmora SCRN Recorder offers a wide range of tools and features which makes screen recording much easier. We can also say that it’s the complete solution for gamers. It can record videos up to 120FPS which is very high and can also record from the webcam at the same time. Hence, there’s no need to use different software to record your screen and webcam at the same time and merging them later using a video editor. The amazing thing about Filmora SCRN recorder is that it has its inbuilt video editing tool which offers the wide range of tools which are enough to give a normal touch to your recorder screen video. 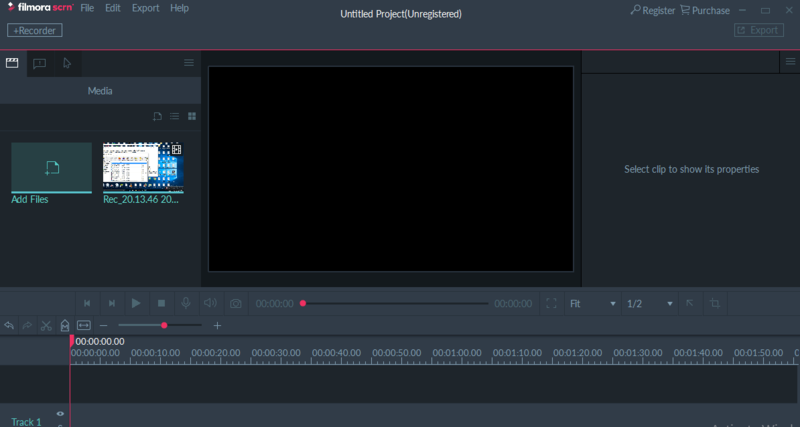 Its inbuilt editor consists of crop tool, adding background music, merging videos and much more like that. If you’ve used Filmora Video editor software before then most of the features of that software are introduced as an inbuilt feature in Fillmora SCRN recorder. Effects tools are also available in this screen recorder. Hence, you can say that this screen recorder is the complete solution for most of the gamers and video creators. PIP feature means Picture In Picture and it’s supported by Filmora SCRN Recorder. As we’ve discussed above that you can record screen and webcam at the same time. This feature is useful for recording gameplay or making some video tutorials or educational videos. Give a try to this feature and shout your knowledge with others. Around 50 file formats are supported and this means that there’s no worry about the video format you want for your exported video file. There are a lot of inbuilt video codecs which will help you to export your video in the format you want. While recording your screen, you can change the size and style of the cursor and it’s one of the important features which is necessary. Because if you’re making a tutorial video, then its necessary to gain the direct intention of the viewer and changing the style of the cursor will help a lot to gain intention to the required part of the video. Also, annotation feature is available which might be another useful thing to gain direct intention of the viewer. Custom recording filed is also one of the features which are very useful in most of the cases as sometimes we don’t want to share the whole screen with the viewers. In such case, this feature is useful. Just select the screen you want to record. These are some of the features offered by Filmora SCRN Recorder. Now let’s talk about its performance. 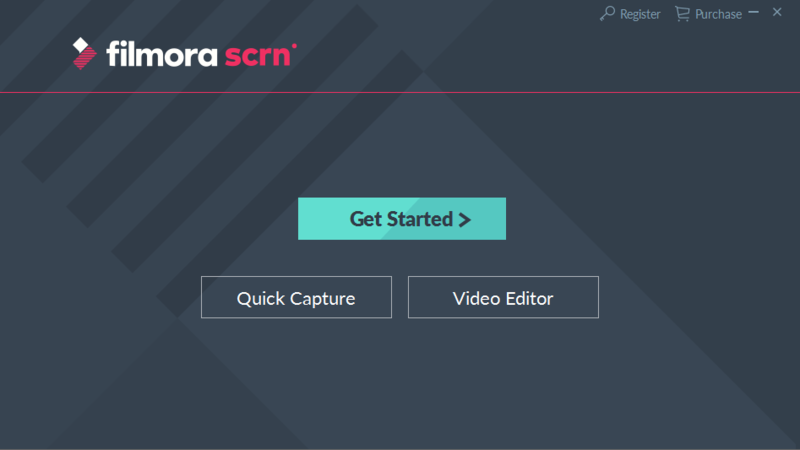 You can easily install Filmora Scrn by using its online installer. You can also use below given button to download the Filmora SCRN recorder and install on your system. Once it is installed on your system, you will see a screen with three buttons. One button on the top gives you the option to get started so you can explore Filmora Scrn from the scratch. Other two button given right below to get started button gives you Quick Capture and Video Editor option. Quick Capture button takes you to the screen recorder from where you can start recording the screen with various customizable options and settings. 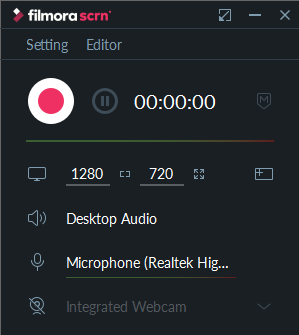 And if you choose to click Video Editor button, then it will take you to the video editing screen from where you can add pre-recorded video files to edit/cut/merge them to make a perfect recorded session. You can also add captions or set various annotations to specify modules given on video. Also, there are various other options which you can explore to make an amazing recorded video session. Or you can simply click the Get Started button from the first window and it will take you to the Setup windows from where you can manage all the modules of Filmora Scrn. From the setup menu, one can choose the options like FPS rate, screen capture type e.g full screen or custom. There’s an option for Game which will record the gameplay in best possible settings or even you can modify the setting as well. From the audio settings, one can choose the audio input device or choose the source to record audio input. Once we’ve clicked on the Capture button, Filmora SCRN recorder started recording the screen with the options we’ve justified before. Shortcuts are also available e.g to stop the recording, we need to click on Stop or simply press F10 button and F9 to pause the recording. When we’ve finished your recording, we were prompted to editing video from where we can choose different tools to edit the video according to give the final touch. Then after giving the final touch to the video, we clicked on Export button and various video format was visible to which we can convert the video. Pricing: Filmora SCRN recorder is priced in the very fair price range. $19.99/ Year and $29.99 for the lifetime. Final Views: This is one of the simple and powerful screen recorders in the market. It’s priced in very well price range and offers a wide range of tools and inbuilt features. If you’re thinking of recording your gameplays or creating educational videos then you should get this software. Other screen recorders like Bandicam is pricey and won’t offer some inbuilt features as Filmora does in as low as $19.99.